This weekend’s musical lineup features folk-pop singers working with classical musicians, a visual artist/composer combining sculpture and sound, a Baroque ensemble performing Romantic classics, a pops conductor composing for a non-pops concert and joining with a fellow orchestra member in an extra-musical affair (dallying with another orchestra), theater actors crashing a ballet, and more mellifluous musical miscegenations. 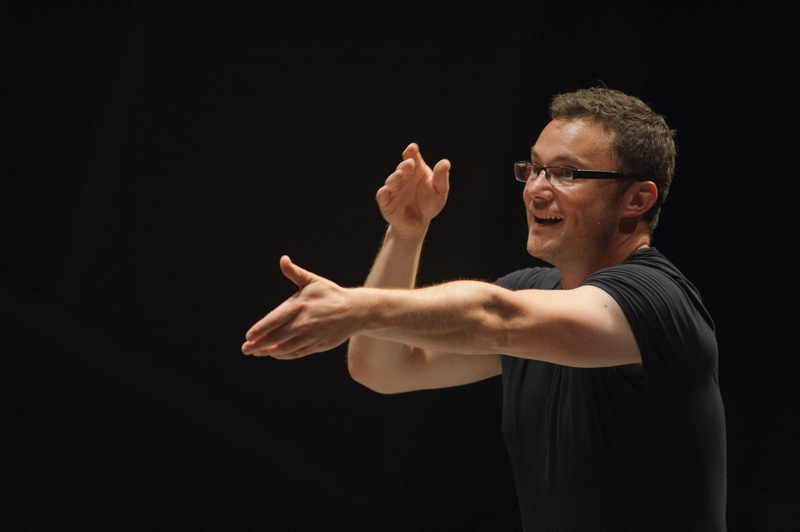 Matthew Halls conducts Portland Baroque Orchestra this weekend. FearNoMusic, Holcombe Waller, Friday, Alberta Rose Theater, Portland. Since making his reputation as an artsy, sensitive singer songwriter, Waller has expanded his musical ambitions; last month’s performance with the Oregon Symphony was easily the highlight of the orchestra’s Portland Indies program, and Friday he enlists the city’s vanguard contemporary music ensemble to perform music from his new song cycle (abetted by interactive video) “Wayfinders,” about human exploration and technology, in anticipation of a fully staged version coming next year. Celin & Celino Romero, Friday, First Congregational Church, Portland. Portland Classic Guitar’s excellent recital series brings the first duo recital pairing by the father-son members of the first family of classical guitar, which has been performing music by Spanish composers for generations and helped elevate the guitar’s role in classical music. Oregon Bach Collegium, Sunday, United Lutheran Church, Eugene. Soprano Heather Holmquest and fortepianist Margret Gries playing some of Schubert’s sublime songs, followed by his every popular ‘Arpeggione’ sonata with Ralph-Stricker Chapman. Lewis & Clark Chamber Players, Monday, Lewis & Clark College, Agnes Flanagan Chapel. Some of Portland’s top orchestral players (Oregon Symphony violinist Greg Ewer and violist Joel Belgique, who also star in Third Angle New Music and FearNoMusic, respectively) join Third Angle pianist Susan DeWitt Smith and other L&C faculty in an attractive program of music by Mendelssohn, Haydn, and Ravel. Eric Stern, Friday, University Club, Portland. With help from guests, the Vagabond Opera singer/founder/accordionist introduces the music of Eastern Europe through performance and stories. Sergei Tcherepnin, Saturday, Portland Institute of Contemporary Art, Portland. The sculptor/composer/sound artist presents a new, immersive composition/installation created for PICA’s capacious second floor. Portland Baroque Orchestra, Sunday, Kaul Auditorium, Reed College. Matthew Halls, the English keyboard player who’s the new director of the Oregon Bach Festival, leads Oregon’s nonpareil chamber orchestra in a fascinating program of concerti grossi (that is, concertos that feature a small group of instruments within the orchestra, instead of the usual solo instrumentalist) by composers familiar (Handel, Geminiani) and not so much (Muffat, Hellendaal, van Wassenaer). Friday’s concert is sold out, but Sunday afternoon’s still has seats available, and so does Saturday’s kid oriented concert at downtown Portland’s First Baptist Church, which allows adults to enjoy much of the music too, along with some explanation. Eugene Symphony, Saturday, Hult Center, Eugene. A trio of actors from Ashland’s Oregon Shakespeare Festival performs scenes from Shakespeare’s “Romeo and Juliet” sometimes interpolated, sometimes in conjunction with Sergei Prokofiev’s intensely dramatic 1936 ballet score based on it. The second half boasts a concert performance of the glorious music from the greatest opera ever, George Gershwin’s American classic “Porgy and Bess.” The ESO, Pacific Youth Choir, and Dance West also offer a kids concert Sunday, with more Prokofiev, Tchaikovsky, Vivaldi and more. Oregon Symphony, Brandi Carlile, Saturday, Arlene Schnitzer Concert Hall, Portland. The Seattle-based pop-folk singer songwriter with a voice ample enough to front a really big band returns after last year’s sold out show with OSO. VIR Friday, First Christian Church, and Sunday, Grace Memorial Church, Portland. The newest project (so new that they apparently haven’t yet figured out how to e-mail a press release to one of the only two Portland print publications that regularly cover choral music) directed by the irrepressible, happily un-retirable Oregon choral legend Gilbert Seeley, who did so much over the last four decades to raise the sights and expand the horizons of Portland’s effulgent choral music scene with the Oregon Repertory Singers and Lewis & Clark College. With co-director and Cappella Romana stalwart Adam Steele, he’s put together a 16-voice men’s choir (maybe a male counterpart of In Mulieribus?) comprising some of the city’s top XY singers, a welcome addition to the flourishing choral scene that Seeley helped build. Vox Resonat, Friday, Central Lutheran Church, Eugene. Led by University of Oregon prof and renowned early music expert Eric Mentzel (tenor with the great Sequentia), the vocal ensemble sings 15th and 16th century settings (by composers including Josquin des Prez and Nicholas Gombert) of the myth of Dido and Aeneas. PSU Chamber Choir, Man Choir & Vox Femina, Friday and Sunday, St. Stephen’s Catholic Church, Portland. The first concert featuring PSU’s new choral prof, Joan Szymko, a fixture on the Portland music scene as music director of DoJump and Aurora Chorus who’s won a national reputation for her choral compositions and conductors, includes music by composers from Latvia, Indonesia, Hungary, Africa and more, including a radiant work by Szymko herself. Festival Chorale Oregon. Sunday, Elsinore Theatre, Salem. If you missed recent performances of “Elijah” by the Vancouver Symphony with Oregon Repertory Singers and the Oregon Bach Festival, here’s another chance to catch Mendelssohn’s big Romantic choral orchestral masterpiece. Julianna Barwick with Hanna Epperson, Saturday, The Old Church, Portland. With the help of the vocal looping that’s enriched vocal music (as it did with guitars, cellos and other instruments) over the past couple decades, the Louisiana-born, Brooklyn-based pop composer contrives a virtual choir of folk-tinged vocals.